T his page is dedicated to the lady and my cousin I call the Hampton family historian, Kathleen Hampton-Lee. And to my late uncles Calvin & Curtis Hampton who I spent many days talking with…just talking about everything, but always returning to the subject of family. Specifically, how they grew up in Arkansas and what family truly means to them. And to my father, Codis Hampton, Sr. who said little but put on a daily demonstration of love and devotion to “Family.” People from down home knew him as C Odis. Its the country pronunciation of Codis. His uncles sometimes called him Moz. The history of our families are entwined just as a piece of cloth is woven. Our parents and fore parents were all bound together by birth families and marriage into others, but we are all bound by blood lines that make us all related to one another. These families all lived in towns and communities that surround each other. Some of the town names are Warren, Banks, Pleasant Hill, Gravel Ridge, Childs, Green Chapel, Hard Shell, Jersey, Hermitage, Johnsville, Morobay, Palestine , Mt. Olive, Vicks, Hampton, and Harrell. Some of the names of families who lived in those communities are Hampton, Davis, Belin, Hall, Tatum, Johnson, Lovett, Strong, Wilson, Pickett, Webb, Phifer, Falls, Green, Momon, Trotter, Newton, Wheeler, Jones, Henry, Harmon, Childs, Woods, Boswells, and Gardner. As you read the biographies of these names, you will see how we all became relatives, better known as “kinfolks.” In a lot of cases we are double cousins, because we are related on both sides of our immediate families. We know that the younger generations from these families do not know most of the families that they are related to. Some of us were born in Arkansas, but were not raised there. Many of us in Milwaukee are related and we do not know each other by face, and in many cases by name, because we don’t know our family’s kinship. This booklet is an attempt to change that. Even if we don’t know each other by face, we’ll have something on record that can be used for years to come to identify each other by name. Use this occasion to introduce yourselves and become familiar with each other. Let this be a beginning for you to get to know as many of your relatives as you can for the short period of time we spend together. It’s so important for our young people to know where they have come from so our heritage is not lost. We hope that this event will spark a yearly or bi-yearly event in which we will gather together to celebrate our heritage. Be proud of who we are and let’s continue to learn of our ancestors. 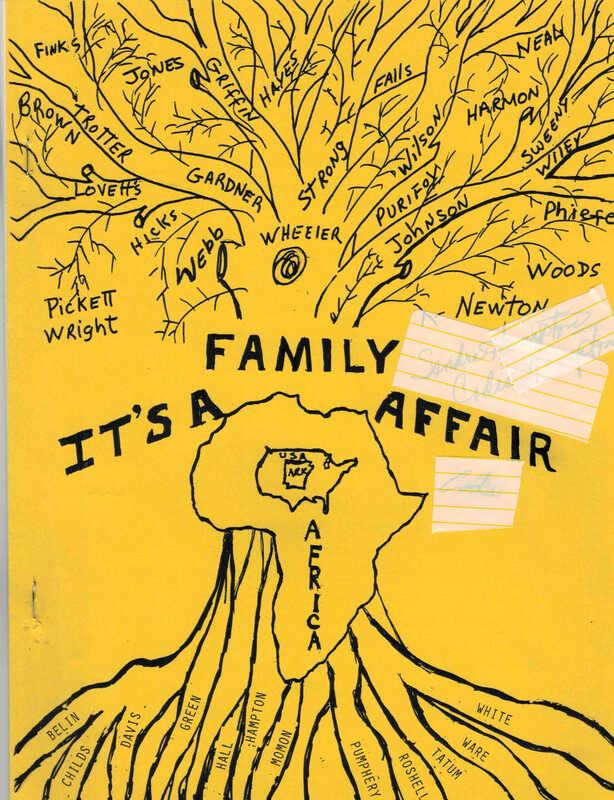 The tree on the cover is an attempt symbolize that our family is like a tree with many branches. The tree represents as many of our root family names that we could gather from our beginning fathers and mothers that lived in the towns and communities listed in the beginning of our book. These names are where our roots began and as we have grown in size, our branches have increased and spread out, producing a strong, fruitful tree with many branches, too numerous to list all the names here. If your root family name is not listed, it is not intentional. That happened as a result of not having the information. During this weekend, please find time to let me know of any omission or corrections. Each biography printed is from information submitted by those families. My information is from older living members of the Hampton Family, as well as other relatives who knew these families. I’m sure that the Hampton’s history in America started at the time of slavery. So I don’t have exact dates. This history began in the early 1800’s. I have not learned all I need to know about that period, but great grandfather, Monroe Hampton I, might have been a slave. The reason I say this is because his son, Monroe II, was born in 1883 and slavery continued until the end of the Civil War. Great grandfather and his wife died by 1885. From what I have learned, they lived in Johnsville and Jersey, Arkansas until their deaths. It is said that they were farmers, but we don’t know too much more than that. Great grandfather’s children lived in different communities and gowns. Monroe II settled in Jersey, Arkansas. Cora Hampton-Coleman settled in Memphis, Tennessee and David (Sambo) settled in Banks, Arkansas. 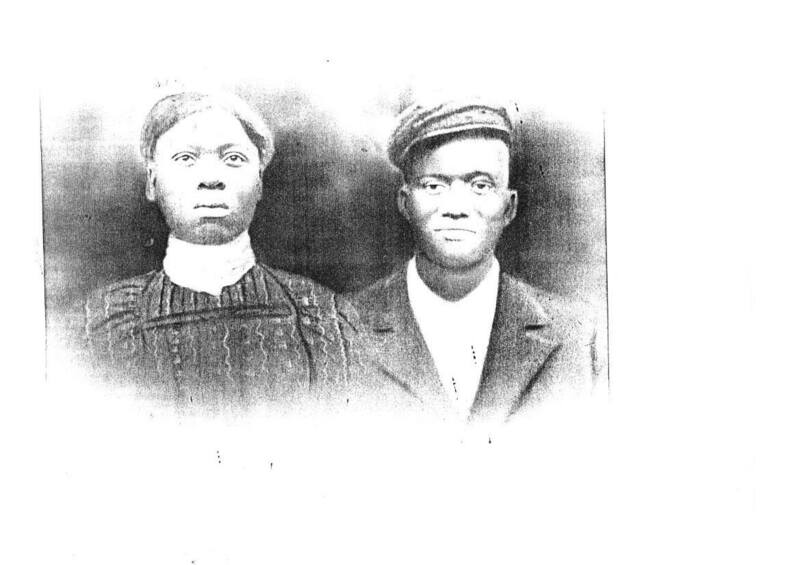 The Hampton’s , I’m sure lived in many towns and cities, but because we don’t know all of them, we cant say where. I do know that Monroe II’s children settled in Los Angeles, California, that is all except one, Gertie Mae Hampton. Gertie Mae married Carnice Gilbert. They live in Jersey, Arkansas and have 9 children and 15 grandchildren. Their oldest child is Norma Sue Gilbert and their youngest child is Jennie Burnett. Their youngest grandchild is Sonya Gilbert. All or her brothers and sisters are listed under Monroe Hampton II. David’s (Sambo) children settled in Milwaukee, Wisconsin. Van D. and Calvin Hampton are their only living children. The names of his other children are listed under David and Sallie Davis-Hampton’s bio’s. We have many other Hampton families out there. If after reading this booklet and you find there are more names and families to add, please let me know. Send them to me or call me land we can talk about it over the phone. Let’s do as much as we can to get to know each other. I know that there are many success stories in our history, however space will not allow us to print them all. Feel free to send me further information so we can write about them next time. Sallie had an older son, Lemon Davis, whose father was Buck Davis, Lemon’s first wife was Arene and his last wife was Lula LaSears. He had no children from these unions. David (Sambo) had two other children, Wadie, whose mother’s name was Lou (Sambo’s first wife) and Vena, whose mother’s name was Lizzie Falls. David was a farmer at one time and lived on his own land with his family. Sallie used her home for a boarding house for teachers. When the teachers could come to teach each year, they would live in her home. It was told to me that Sallie’s father Oliver either sold or gave the land for the first Oaklawn Methodist Church. Monroe and Mittie Lue Belin Hampton are deceased. They had 1 child to their union who died shortly after birth. Monroe and Mittie Lue raised their nieces and nephews from their sister’s and brother’s union (Oddie Lee and David Hampton) after Oddie Lee died. End of Kathleen Hampton-Lee’s submittal. Update for May 29, 2018. Description: The Arkansas Chapter of the Afro-American Historical and Genealogical Society (AAHGS) was founded in 1997 by a group dedicated to preserving and sharing genealogical and historical research techniques, conducting educational programs and preparing exhibits. Our goal is to bring to light, through research, study, collaboration, documentation and presentation, the History and Heritage of Arkansas people of African descent. Note: It’s a great place to connect with people from Arkansas and other areas. You can post there with questions about family, read posting from others. Check it out. Kelly Shea is a good family researcher. You can find her posting on the site and ask her questions. She is the daughter of Joe Von Hampton. There is also a Facebook site called Friends of San Diego African American Genealogy Research Group. Click on https://www.facebook.com/groups/SDAAGRG/ Contact Beverly Harper with questions. She is a good researcher too. And finally, there is a site I maintain on Facebook entitled Milwaukee Now and Then. Description: Members who were born, lived and have a Milwaukee connection are welcome to post pictures and comments. Although we will let in anybody who has interesting things to say. We hope to make it a fun group with interesting postings. The aim is also to keep people and family members from in Milwaukee and around the mid-west connected. Please post your ancestral question if searching for a loved one. Or just enjoy the assorted post. You can always contact me at champtonii@yahoo.com. Or check out my site at www.hcofa.net. End of May 29, 2018 Update. Click on the DL Hampton Obit above to access David L Hampton Obituary. The document was forwarded to me by his daughter, Gwendolyn Hampton-Ellis. You can find DL’s name on the 3rd tree at the top of the page. Cousin Gwendolyn also advised that a Family Picnic will be held on October 6, 2018. I will post the details as I get them. For now, Thanks Gwen and sorry for your loss of such a prominent member from our Hampton Tree. Thanks, CHII, champtonii@yahoo.com. Updated May 29, 2018. I’m Gertie Mae Hampton-Gilbert’s grand-daughter. I know that my dad Richard Gilbert is her youngest child. And there have been multiple grandchildren born since Sonya Gilbert. I love this website and I hope you will continue to update it. Great job! Thanks for your comment Latasha. I have been remiss about the updates but will begin to resubmit updates on a monthly basis. Thanks again for your support. Sorry to hear of your loss. I will pass the message on. Could you forward me a copy of the obituary. And any other information I can use to update our or start a new Ancestry page. A single or family picture would help. He was eight years younger than my father (Codis, they called him C Odis down in Banks Arkansas) would have been had he lived. Send it to PO Box 668, Pittsburg, CA 94565. I am trying to determine where DL, your father would be placed on our family tree. Did his father (Monroe) have a brother name David (Sambo) Hampton? Hey Gwendolyn, Doesn’t your father, DL fall on the Monroe Hampton II, Norma Newton? As in they were his mother and father?I am thinking that is the connection to the Hampton family. Thanks, Gwen. Looking forward to it.